Just when you thought you couldn’t see any more ridiculously awful Houston Astros highlights, rookie infielder Marwin Gonzalez comes through big-time. You might recall that, just a few weeks ago, we told you about how the woeful Astros blew a chance to steal a game from the first place Nationals with an epic series of blunders in the top of the 11th inning. It might have been the most awful series of plays we’ve seen all year. Apparently Gonzalez left the game with an ankle sprain and is listed as day-to-day. But you have to respect a guy who’s hustling for a last-place team in August, right? Still, it’s pretty hilarious. 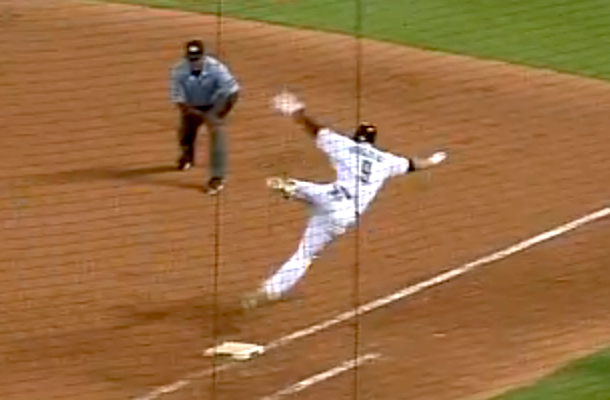 I’ve watched this replay about 15 times now, and I still don’t know how the heck this happened. Man, I love the ‘Stros.